There’s more to wildflowers than just their beauty. Planting these pretty and fragrant flowers will not only add colour to your outdoor area, but it’s also a great way of attracting bees and other important wildlife to your garden. The good news is that you don’t need acres upon acres of land to make a minimeadow. 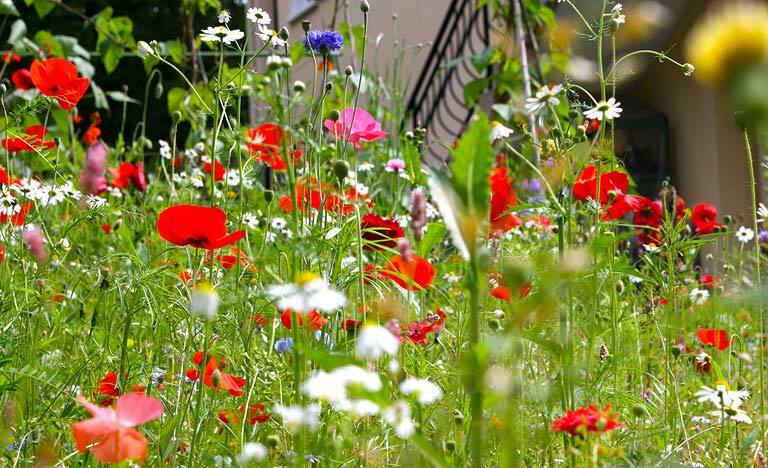 Any patch of lawn in a sunny position can be turned into a rich wildflower meadow that’s easy to maintain. Sadly, many bee species are on the decline globally. By cultivating a good mix of nectar and pollenrich wildflowers, you can turn your garden into a haven for these useful little critters helping turn around the steep decrease in their numbers. Most seasoned gardeners will tell you that it’s best to sow wildflowers during March and April, or in September. Autumn sown seeds are usually quick to sprout, especially on light soils although there are always some slower seedlings that won’t come up until the following spring. On heavy soils, you’re best off waiting until spring to sow because seeds and seedlings can rot during winter if the ground becomes oversaturated with water. You can sow wildflowers in pots or planters for patios, balconies and doorsteps. The roofs of garages, garden sheds, bike boxes and wood stores also make good places for minimeadows. After sowing the seeds, make sure the soil remains moist, or water if dry. You only need to water seedlings occasionally the great thing is they don’t require a lot of attention; they’re wild. Wildflowers like natural soil that hasn’t been fertilised. To create a wildflowerfriendly lawn, stop using fertilisers and weed killers, and mow it regularly, making sure the grass stays short. Rake the soil if it’s lumpy, the seeds may get buried and if it’s too hard, the wildflowers won’t be able to root properly. Don’t sow wildflowers into areas in heavy shade. Combine wildflowers, native herbs and ornamental grasses for a hardy but beautiful meadow. For additional colour and interest, add rockery and alpines to your garden. 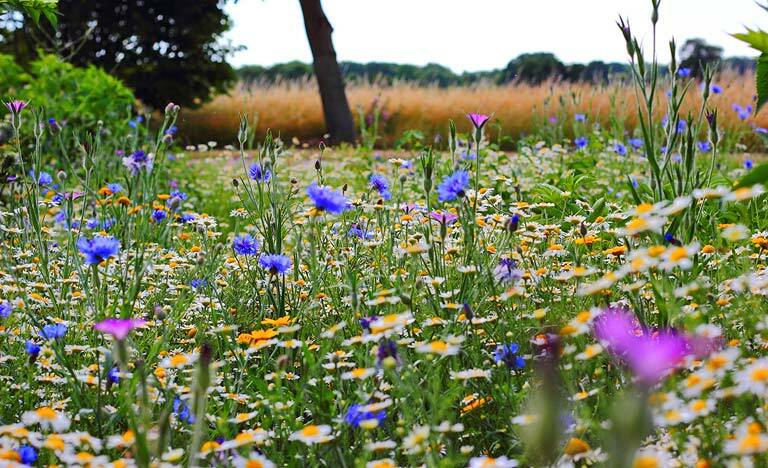 Quick and easy to lay, wildflower turf is a nifty little cheat for making your garden colourful, beautiful and a haven for wildlife. Made up of 50% wildflowers and 50% grasses, it’s also an excellent way to avoid weed invasion. Neither explosive nor edible, seed bombs are little balls made up of compost, clay and seeds. They’re very straightforward to use simply scatter on top of soil or compost and let nature do the rest. You can even get special varieties of seed bombs, filled with wildflowers favoured by bees and butterflies. Cut or trim the grass in August. Leave it until September if you want species such as Agrimony and Betony to get a hold. Leave the grass that has been mown where it falls for a week, turning it over while it dries, to allow seeds to drop down into the soil. Keep on top of weeds; wildflowers are tough and grow fast, but it’s important to get rid of any unwanted plants that threaten to take over. 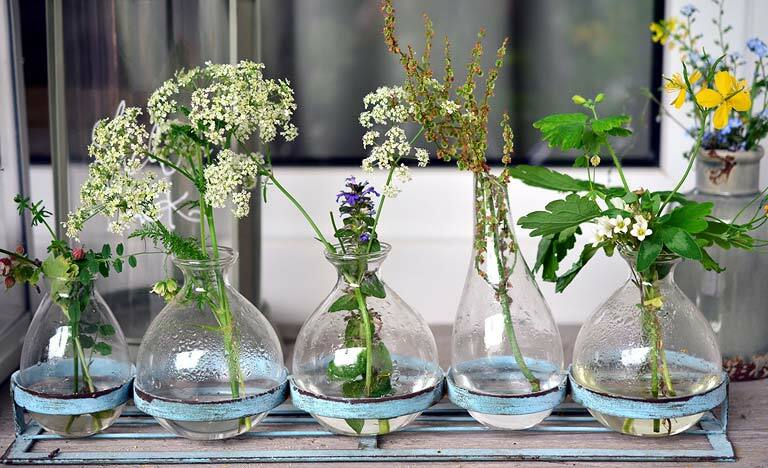 Why not try these wildflowers for starters? Creating a great look for your outdoor space is just as important as putting your stamp on the interior. Your garden is an extension of your home so why not give it the attention it deserves? 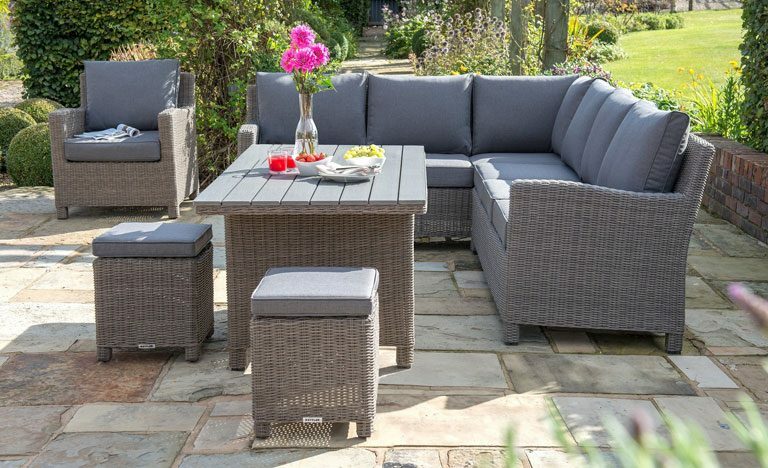 With the right furniture and accessories, you can easily turn your garden into your favourite space. A haven within your home. Deciding on an authentic style for your garden and furnishing it, is all part of the fun. It can be as simple as finding just the right piece of furniture to be the centrepiece of your garden. How much space do you have? One of the most important aspects as the furniture should fit seamlessly in the space. Have you got somewhere to store the furniture? If you don’t have room for storage, consider furniture that can stay outside all year round. What’s your budget? Weigh it up. Investing a bit more on high-quality furniture can have longer term benefits. Furniture should be built to last and spending that little bit more can result in you getting a much better quality piece of furniture, which represents better value for money. 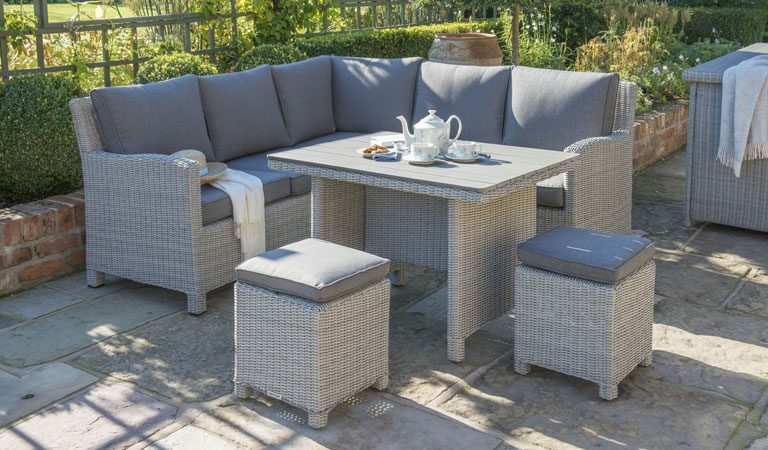 There are so many options available, including garden benches, parasols and sun loungers, larger patio sets, hand-woven rattan garden furniture and a huge range of accessories. Space will have a big influence on the furniture set you decide to buy. Garden and patio sets come in all shapes and sizes so you will always find something that is perfect for you. Use your space wisely and if you’re limited for space, a stylish, compact and easy to store table and chair set is a good choice. You don’t even need a garden; tables and chairs of this style can also fit on a balcony. They are made with durable, lightweight and weatherproof materials, but they should still come with anti-rust warranties for added protection. If you’re lucky enough to have more space and the desire to fill it, you have the option of larger, 4 to 8 seater sets. 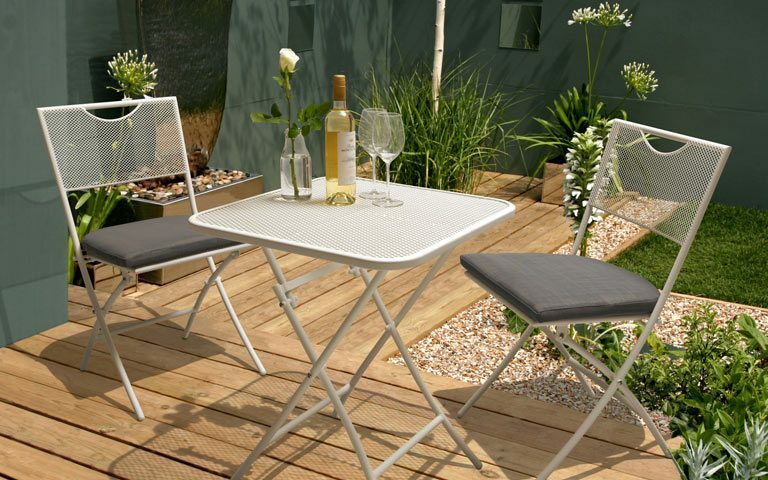 Extendable garden tables offer even more space, seating over ten, so you can invite a few extra friends or family. The next consideration is shape. Round, square, rectangle and even oval tables are available and in many cases, the shape can be a matter of taste. As with tables, chairs come in all shapes and sizes. Some of the garden furniture chairs are ergonomically designed for maximum comfort and should be considered. High-backed chairs also offer an extra element of comfort. 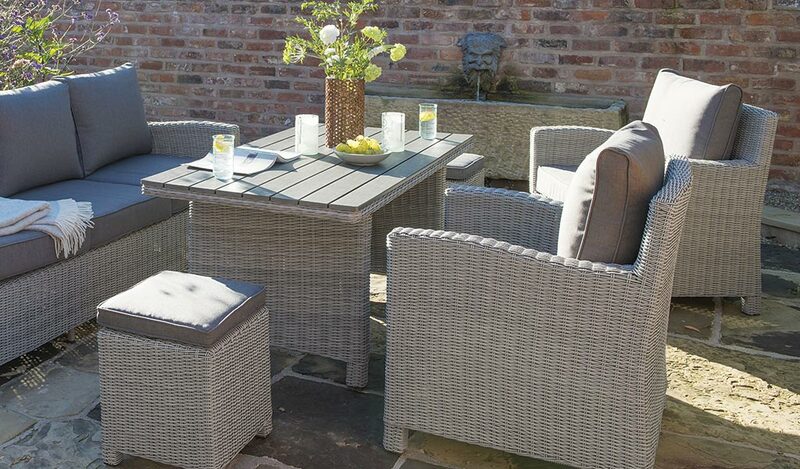 Casual dining furniture offers a sophisticated, luxury and contemporary option for your garden. They are a real statement piece, visually striking but also designed and built for both lounging and dining. These sets also work well as elegant indoor furniture and are ideal for conservatories, making the most of your furniture all year round. Kettler’s Casual Dining range features bespoke-sized outdoor tables, which are positioned at a lower height than regular garden dining tables, making them perfect for eating, drinking and lounging. Each table and chair is hand-woven from high-quality, UV-resistant weave, and comes in a choice of rattan and white wash finishes. The casual dining sets also work well as elegant indoor furniture, for example in a conservatory. 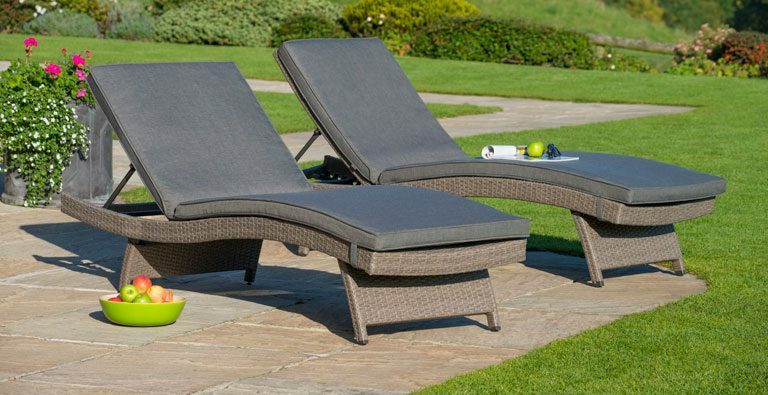 Sun loungers and chairs come in a wide range of styles and materials and are the perfect addition to your garden, for relaxing and soaking up some sunshine. Ergonomically designed loungers will not only create additional comfort but can reduce tension in the back and neck. Rattan wicker loungers, with their sumptuous cushions, are a luxurious option. They are usually designed with multiple positions for complete comfort and a stylish look. Wicker loungers are easy to stack and because they are relatively lightweight, they are also easy to manoeuvre and store. If wicker loungers aren’t your style, or you don’t have enough space, you could always consider metal framed sun loungers. They are fully adjustable, foldable, often have wheels so they’re easy to move around and many don’t require cushions due to the materials used, such as synthetic fabrics. Whatever lounger material you choose, consider whether you can leave it outdoors and if you should buy one with a warranty. Kettler loungers – whatever the material – are designed to be left outdoors (excluding cushions) and backed by a 3 or 5 year warranty, dependent on material. If you’re more inclined to sit upright, deck chairs and armchairs, including wicker chairs, are a good option – especially if you’re limited for space. Wood and metal frame options are available and you can add a touch of colour to your garden with your own choice of deck chair fabric. Spending the morning in your garden, sipping a coffee, is a great way to start your day. Having a bench or companion seat in the sun-drenched corner of your outdoor space is the way to do it. Garden benches and companion seats will age beautifully and if you’re looking for some extra comfort, consider adding some tailored cushions. 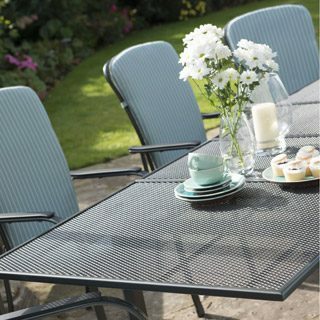 Garden furniture comes in a whole variety of materials. As with most products, the quality of the material will have a big impact on the overall appeal and durability of your garden furniture. It is for this reason that you should consider spending at the top end of your budget to buy something that will not only look great but last. 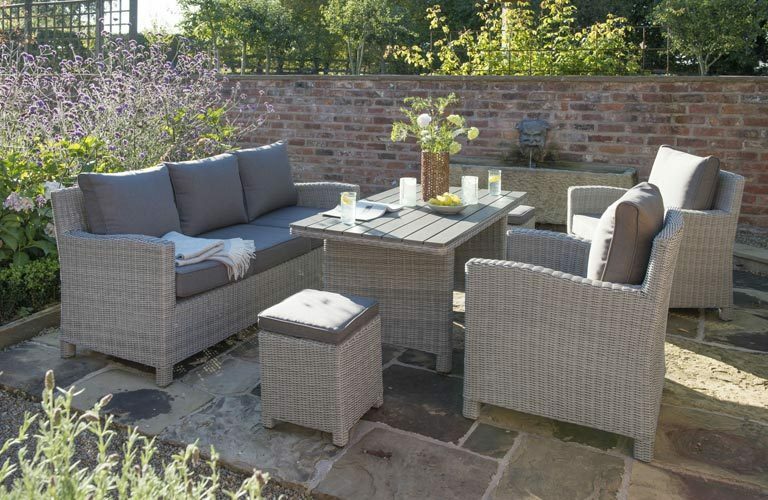 Rattan garden furniture is, or should be, hand-woven by experts using only the finest of palm species. It can be considered less durable and more susceptible to the effects of moisture than synthetic rattan. Natural rattan is weather and UV resistant. However, it should be stored indoors through the winter. Synthetic rattan combines the looks and style of natural rattan, but with added durability that means it can be kept outdoors all year round. Visually, it can be very difficult to tell the two apart. It should, however, still be hand-woven to give it the quality it deserves. Synthetic rattan is less likely to get damaged, damp or snag your clothes than traditional rattan. Bear in mind that while the furniture itself can stay outdoors during winter, accompanying cushions and other accessories will need to be stored. Synthetic rattan is lightweight and easy to maintain, and the furniture looks great indoors too. Wood can be a very personal choice. Ask around and you’ll find that people like different woods for different reasons. There are a number of different woods most commonly used for garden furniture: pine, oak, teak and redwood for example. Each is unique with different characteristics. If you opt for the natural style of wooden garden furniture, you’re buying items that should be strong and durable. They do demand more maintenance than metal because they require regular treatment against warping and water damage. It will prolong the life of the furniture and help it age beautifully. 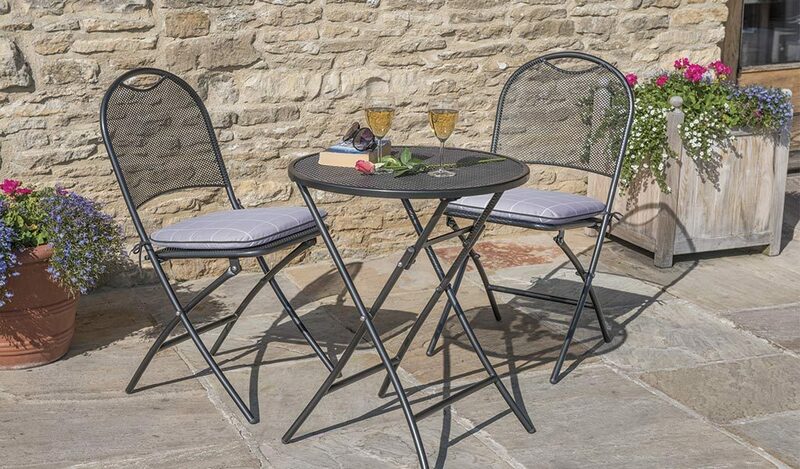 Metal is tough, durable and can be left out all year round, making it a great option for garden furniture – especially if it comes with an anti-rust warranty. Many metals are available, including aluminium, cast aluminium, steel and iron. They can be ornate in design, incorporating intricate patterns. Aside from the durability of metal garden furniture, this is one of their main attractions. Metal has the advantage that it doesn’t need to be sanded or oiled like wood but then again, some people just love the feel of natural wood. Metals such as wrought iron are susceptible to rust so it is worth doing some more research before you commit. If you do go for garden furniture that can’t be left outside all year round, or you just want to keep your furniture out of the way when not in use, storage is an important consideration before you buy. 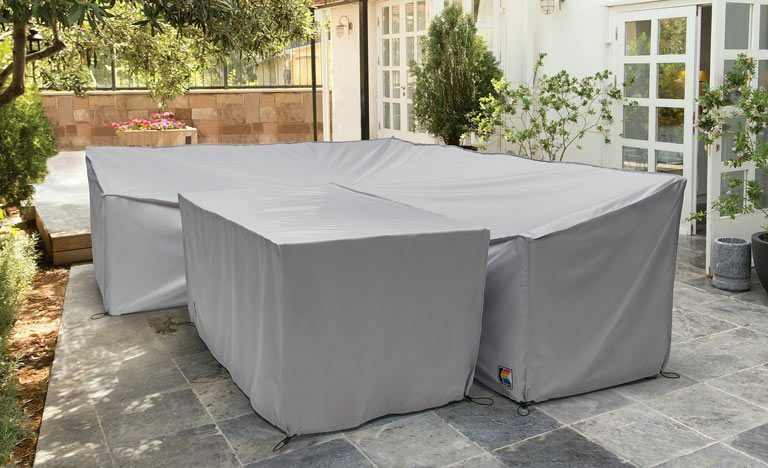 If you don’t have enough space to store your furniture and it is not weatherproof, you need to consider what kind of cover you’re going to buy. Proper protective covers can help to prolong the life of your furniture. They are fully waterproof and will protect against the elements. We do not recommend the use of plastic sheeting to cover the product; always choose a breathable cover to protect from damp. 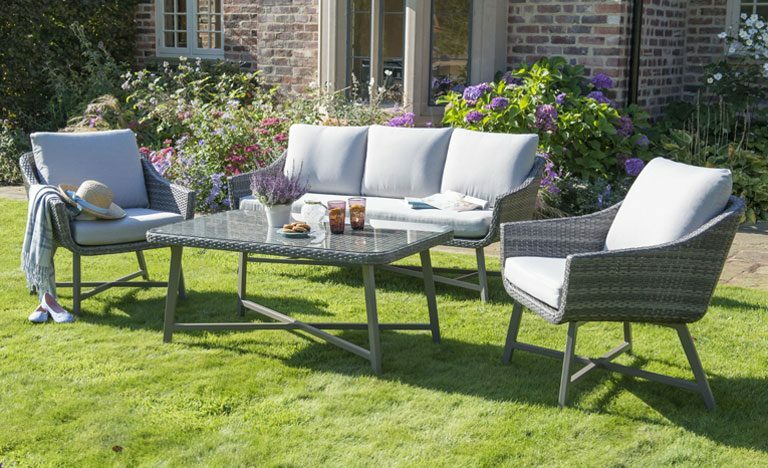 If you want your garden furniture to last and look great for as long as possible, make sure you know how to care for it properly. Wood and wrought iron, for example, both need regular attention, but there are lots of materials that will serve you well, even with minimal maintenance. Clean wood at the start of the season, using warm, soapy water or hardwood cleaning fluid. You can lightly sand the furniture but remember to brush off dust and cover with wood paint or stained oil afterwards. Wood needs regular treatment to stay in good shape. Rattan weave should be cleaned regularly with warm, soapy water. If your rattan furniture has a metal frame, see below for tips on how to look after this. Wash metal furniture regularly with soapy water, using a non-abrasive cloth or sponge. Consider polishing it with car wax after washing, to make it more water-resistant and extend its lifespan. Make sure you treat chips and scratches to prevent rust from appearing. It’s the attention to detail that makes all the difference. Adding accessories to your garden furniture can not only make them even more attractive, but it can also add an extra level of comfort and shade. Pick a colour scheme that reflects your style and use subtle touches of colour to complete the look. From tailored cushions to parasols and gazebos, there is an endless amount of options. Let your imagination dictate how you style your outdoor space. If conventional furniture doesn’t excite you, go for something different. Perhaps a hammock, tied between two shaded trees, or some outdoor beanbags would give your garden an ambient touch. 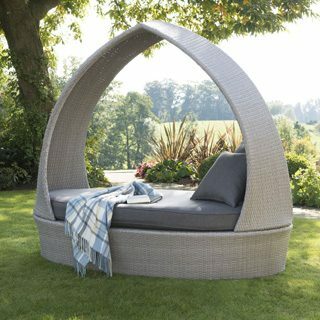 For something completely different, rattan relaxation pods with deep, luxurious cushions will help you keep cool and look chic.